The current 3-year campaign, ‘We can. I can.’, which began in 2016, reflects on how everyone - from the government and health sector, to individual citizens and people with cancer - has a role to play in reducing the burden of cancer. Taking a collective approach, organisations have the power to create healthier schools and workplaces, improve access to cancer care and shape policy. From an individual perspective, we could make healthier lifestyle choices or play a more proactive role in early disease detection. Individuals with cancer could also ‘take control’ of their cancer journey. The feeling of loss of control is common among patients because they have little or no control over their diagnosis, test results, or even side effects of treatment. Enabling patients to play an active role in decisions about their care and respecting their decisions can empower them to regain their sense of control throughout their cancer journey. To facilitate this, healthcare professionals can take a people-centred care approach to ensure patients have sufficient knowledge and understanding of all treatment options, including risks, benefits and possible uncertainties, to make decisions that are right for them. The phenomenon of people-centred care, or patient-centricity, has gained significant attention over recent years, becoming somewhat of a buzzword within the healthcare industry. The reasoning behind this is multifaceted, partly stemming from the increased pressure on existing health services, but equally from the fact that patients are now better educated on their medical conditions and are more interested in playing an active role in their health than they might previously have been. Focusing on patient-centricity is also advantageous for health providers - they typically achieve their best outcomes when services are delivered in line with the personal preferences and medical needs of patients. Until recently, patient involvement in pharmaceutical development of medicines has been minimal, aside from participation in clinical trials. But since patients are the end users of these medicines, it is logical to incorporate their views, values, desired outcomes and preferences in the development process. AstraZeneca has already started displaying signs of a shift towards a more people-centred approach, using online patient platforms and networks to connect over 30,000 patients in focus groups to capture information about their health journey. They also have plans to develop ‘Patient Expert Networks’ to advise brand teams on the joint creation of patient solutions. However, the adoption of patient-centricity within cancer care still has a long way to go. A 2017 patient-led study published in Frontiers in Pharmacology reviewed 20 clinical cancer guidelines and surveyed patients in 18 countries over 4 continents. The study concluded that, despite patient-centricity being a leading paradigm within cancer policy, it is not yet standard practice to incorporate the views of patients at all appropriate levels of decision-making. Suggested reasons for this include a lack of time or tools to allow for treatment planning, insensitivity to patient information, and a lack of incentives for providers to devote time to people-centred planning. World Cancer Day is, therefore, the ideal opportunity to raise awareness of the need for people-centred cancer care and to empower patients with cancer to take back control of their cancer journey and voice their preferences. Flott K, Hounsome L, Vuik, S et al. A patient-centric approach to improving experience in urological cancer care. J Clin Urol 2017; 10(Suppl 1): 39-46. Hajdu H. Overview on patient centricity in cancer care – frontiers in pharmacology. Available at: http://www.youthcancereurope.org/youth-cancer-news-events/2017/10/overview-on-patient-centricity-in-.... Accessed February 2018. Narbutas S, York K, Stein B et al. Overview on Patient Centricity in Cancer Care. Front Pharmacol 2017; 8: 1-12. Newsom T. How to cope with loss of control as a cancer patient. Available at: https://www.mdanderson.org/publications/cancerwise/2015/05/how-to-cope-with-loss-of-control-as-a-can.... Accessed February 2018. PDD Innovation. How patient-centric is the pharma industry? Available at: https://www.pddinnovation.com/how-patient-centric-is-the-pharma-industry/. Accessed February 2018.
du Plessis D, Sake J, Halling K, et al. Patient centricity and pharmaceutical companies: Is it feasible? Ther Innov Requl Sci 2017; 51(4): 460-467. Yeoman G, Furlong, P, Seres, et al. Defining patient centricity with patients for patients and caregivers: A collaborative endeavour. BMJ Innov 2017; 3(2): 76-83. 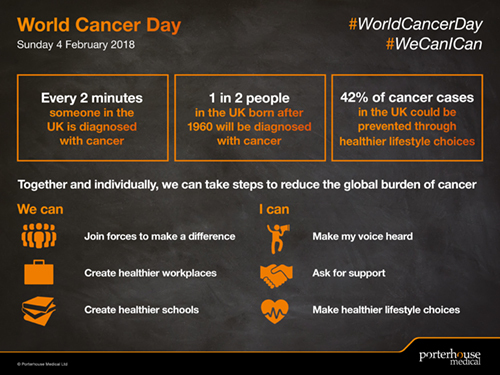 World Cancer Day. Available at: http://www.worldcancerday.org. Accessed February 2018. Cancer Research UK. Available at: http://www.cancerresearchuk.org. Accessed February 2018.